Shaadi Pictures Of Malik Riaz's Grandson Are Oozing With Royalty And My Goodness! The wedding season is in full swing! From Deepika Padukone and Ranveer Singh’s big fat wedding to the colorful wedding festivities of Priyanka and Nick Jonas, a month-long wedding event of Aiman and Muneeb to our mohallay ke bhai sahab, everyone is getting married! While our newsfeed is full of wedding pictures of these celebrities, Malik Riaz’s grandson’s wedding pictures took over our newsfeeds! After all the lavish mehndi and dholki events, the wedding ceremony took place at Bahria Town, Lahore yesterday. Zoraiz Malik – the grandson of Malik Riaz and son of his eldest daughter, Aasia Amer got married to Zainab Bashir. Look At All The Preparations, Yaar! Gold Made Sehra For The Groom! Here Comes The Dulhe Raja! And Here Comes The Lovely Bride! Saasu Maa Welcomed The Bride On The Stage! The Couple Is Looking Adorable Masha Allah! It Is A Happy Picture Indeed! So The Family Has Made Bride Confused On Doodh Pilai Ki Rasam! Malik Riaz Is Helping The Bride Sit In The Car After Rukhsati, Isn’t It A Cute Moment For Her? 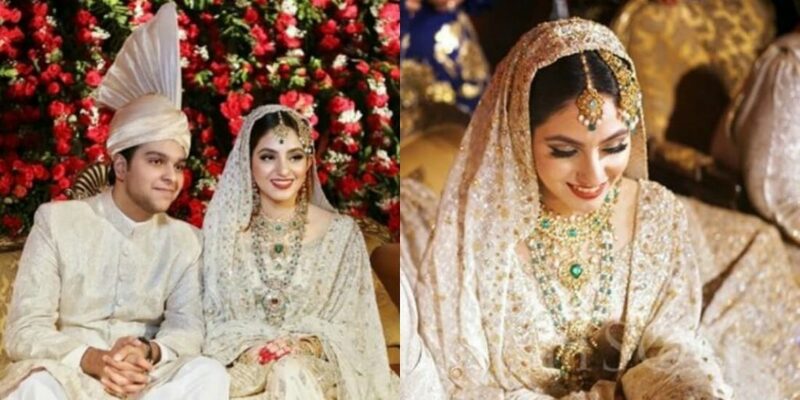 After witnessing the grand wedding festivities of Malik Riaz’s grandson, people were expecting the same luxurious and lavish Baraat ceremony! Let’s see what has been left in their bag to present on the valima!